Located in the Indian Ocean, the Maldives are a collection of tropical islands made up of 26 atolls and more than 1,000 coral islands. The country is well known for its breath-taking beaches, crystal blue lagoons, and some of the best reefs for diving anywhere in the world. The islands feature luxurious beach getaways, but also has the added bonus of bustling markets, premier dining, and shopping you won’t find anywhere else. Any of the following resorts will make your stay that much better. W hotels are known for being distinctive and cutting edge and it’s no different in their Maldives resort. 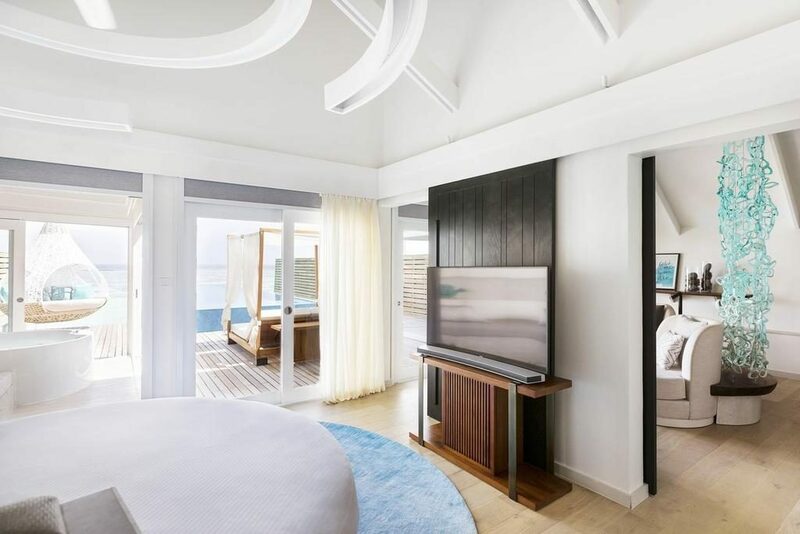 Located on the beautiful and private Fesdu Island, W Maldives is the epitome of luxury in each of its suites and ocean havens, each with its own deck and plunge pool. When you aren’t enjoying the turquoise water in the house reef, home to wondrous wildlife, and white sandy beaches, you’ll enjoy a pampering spa menu, six gourmet restaurants, and a lounge bar. The water sports menu is adrenaline-rushing with parasailing, windsurfing, diving, snorkelling, water skiing, sailing, and more. Luxury abounds here, but there’s also plenty of rest and recreation to choose from. Enjoy villas that cater to adventurous visitors or kick back in style in one of the over-the-water studios on one of two private islands: Play and Chill. Hop back and forth between the two islands for alternating thrills and adventure and tranquillity and relaxation. An exclusive spa and premier dining are ideal for after a day of water sports, biking, or reef diving. Nestled in the South Atoll, this luxury 5-star resort is a haven for a laid-back island getaway and especially for unplugged vacations. The 193 villas extend out onto the water, giving you a premier experience. Facilities include two infinity pools, floodlit tennis courts, a cinema, and a luxury spa. When you aren’t enjoying being in or near the ocean on the two miles of stunning beaches where you might catch a glimpse of a whale shark, you can enjoy the state-of-the-art fitness centre. Mudhdhoo Island is a gorgeous part of the Maldives and home to this resort with some of the best diving, snorkelling among manta rays, and swimming in the country. 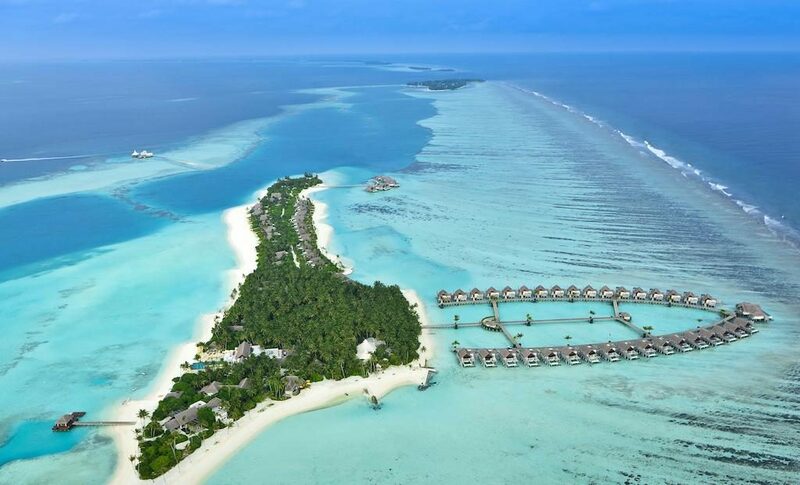 Located on a UNESCO World Heritage Site, the resort features 360-degree ocean views, a turquoise lagoon and white sandy beaches, as well as spa rooms elevated coconut trees, and activities for families of all ages including tennis, yoga, and cycling. 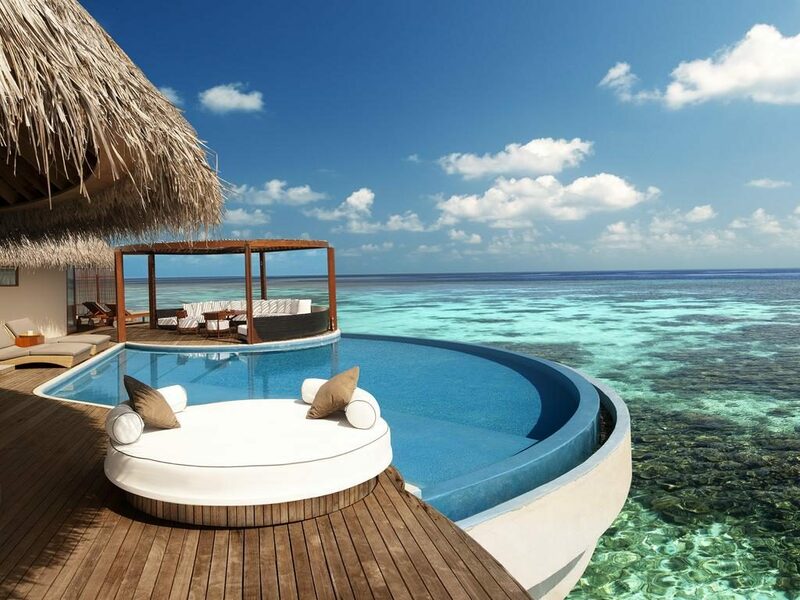 Dusit Thani also has one of the largest infinity pools in the Maldives. 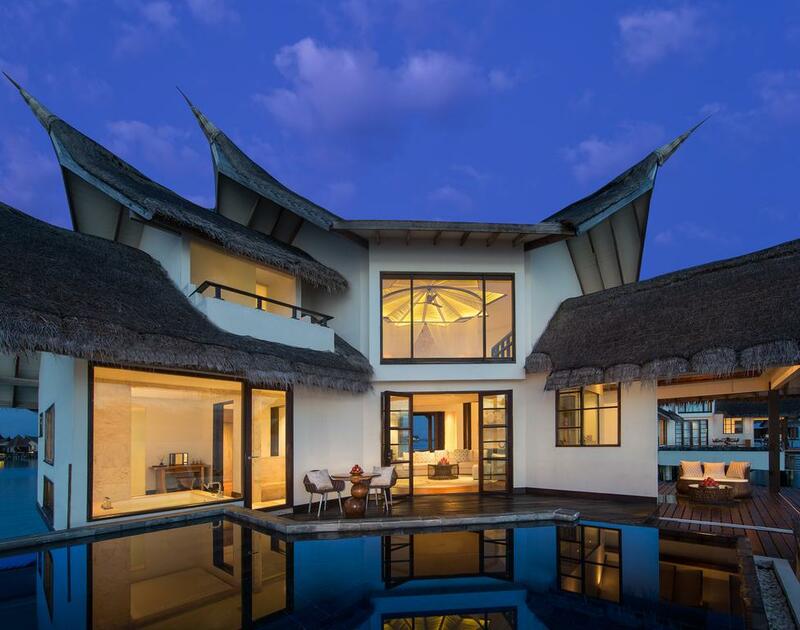 This resort is perfect for couples and families and boasts 89 villas and suites, each of which has its own pool and direct access to the ocean or lagoon. 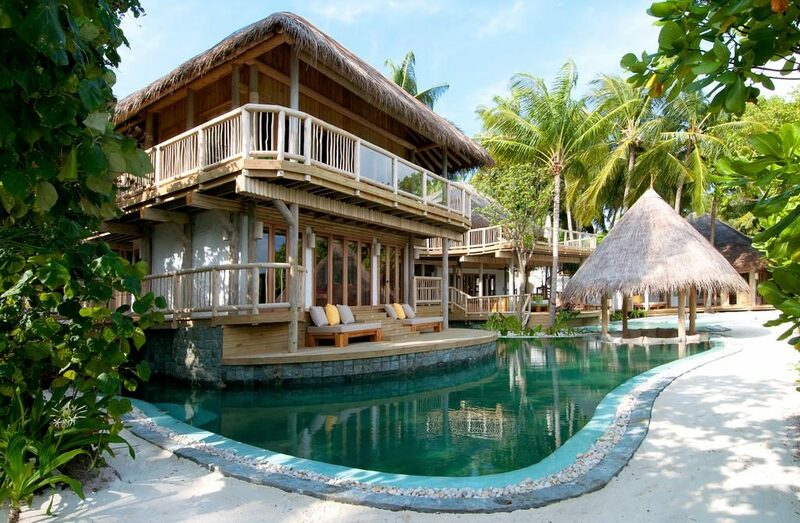 The free-standing ocean villas offer the utmost in luxury for a romantic getaway. 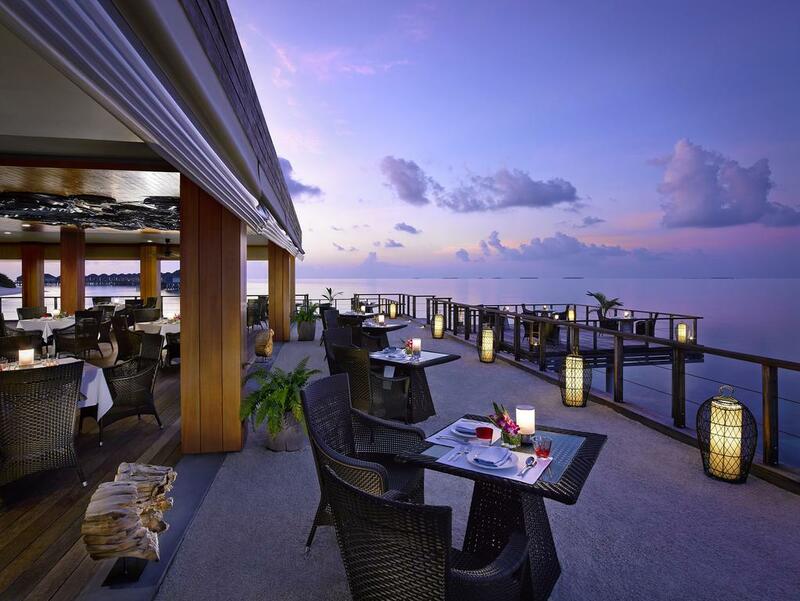 The restaurants offer a selection of cuisines and one is situated over the water. 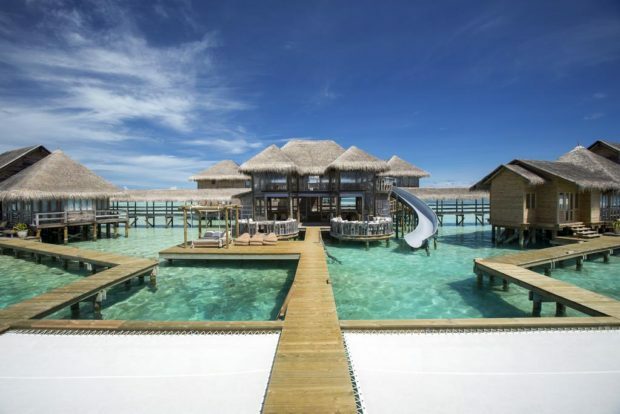 As with all luxury hotels in the Maldives, there are plenty of opportunities for water sports including diving, snorkelling, windsurfing, and canoeing. A premier spa, fitness centre, and kid’s club make this the ideal place for a romantic getaway or family holiday. 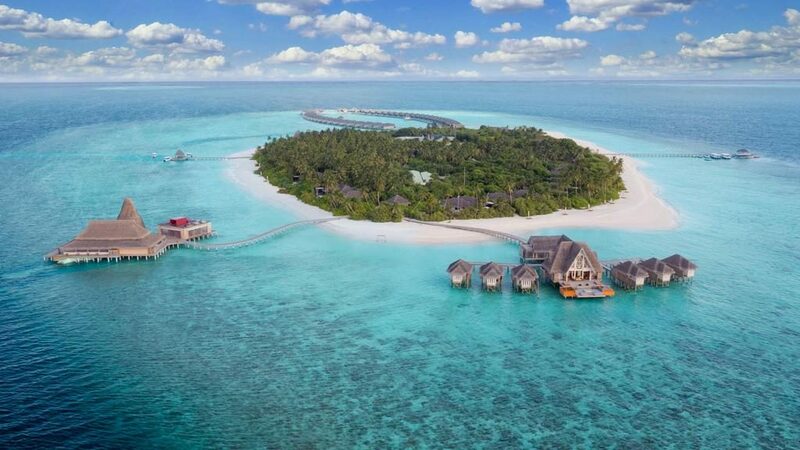 This beachfront haven is one of the best for exploring the Indian Ocean from either your oceanside villa or over the water villa nestled amid lush vegetation on a pristine island. Crystal waters are prime for snorkelling amid the five species of turtle that call the reef home and there’s an underwater dining room for a truly unique experience. Don’t miss the on-site holistic spa which can tailor-make a wellness experience during your stay or the many dining options. This resort can be found on its own private island nestled amid lush green foliage. In addition to the traditional villas, the resort also offers the Private Reserve, complete with its own gym, chef, and children’s area. All of the villas are luxuriously outfitted with pools and plush bedding and the resort also offers premier diving, a Lego room, music room, library, and decadent dining options to please any palate. An excellent menu of excursions and activities includes a picnic, dolphin sunset cruise, eco-friendly wind surfing, and an astronomy dinner cruise. Located on the North Malé Atoll, this superb 5-star resort presides over the ocean with its luxurious villas complete with decks and over water hammocks. Indulgent gourmet dining and romantic white beaches make this a great place for couples. There is an excellent choice of water sports which include lessons for beginners in windsurfing, catamaran sailing, water skiing and wake boarding, and of course, diving. There’s also a number of daily excursions meaning that families will also enjoy a stay here. Cooking classes and an exclusive spa are also on site for fun and relaxation when you aren’t strolling the beach or enjoying the mesmerising views of the turquoise Indian Ocean.